KraussMaffei Group GmbH is a manufacturer of injection molding machines, machines for plastics extrusion technology, and reaction process machinery. 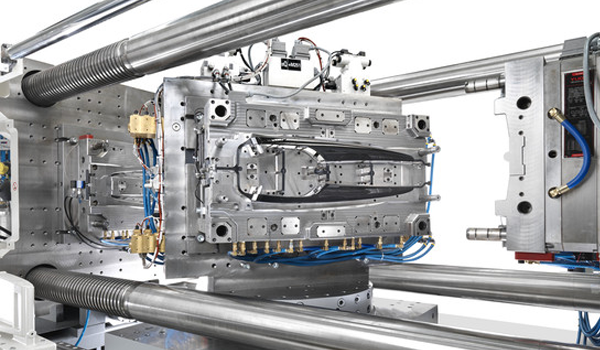 KraussMaffei will showcase its 18 injection molding machines, including three world-firsts, to demonstrate its leading expertise in a variety of applications and industries at the KraussMaffei Competence Forum on June 6 and 7 in Munich. The forum is fully centered on its main theme “Processing intelligent materials with intelligent machines”, which will be part of the brilliant exhibition of injection molding technology. Visitors will have the advantage to see the premieres of the PX 25 and PX 320, showing the expanding of the clamping force range both upwards and downwards for the all-electric machine series. The new GX Speed will be on view for the first time in Europe to show its strengths in the area of large packaging and logistics solutions. The GX 650 Speed will present a 400-ml popcorn flower cup with a wrinkled surface look. GX 400 will be showing fittings built from polypropylene in a 10-cavity mold. An innovative link guide, the 6-axis robot with a high-tech gripper and the integrated sprue disposal will be other highlights of the demolding process. The new innovative CX series comes with the world-first DCIM (Direct Compounding Injection Molding) that refers to compounding. Customers can combine or compound their material with additives, fillers or fibers themselves and save significant costs. Many innovations at the competency forum include 3M hollow glass microspheres on the MX 1600-12000 to minimize weight for lightweight automotive construction or for insulating properties in construction. The other development of new GFE fiberglass direct feeder offering new options for lightweight construction; silicone processing (liquid and solid silicone), lightweight thermoplastic construction with FiberForm technology and ColorForm applications featuring piano black.